Gelco's special dip-painting system gives this cap a beautiful, low-luster, high temperature enamel-like finish. The lid is 24- ga., and the 18-ga., 3/4" mesh is 8" high. This cap grips the flue tile with pointed, slotted, hex-head setscrews. With our weld nut technology, stripped threads are a thing of the past. The Gelco galvanized single-flue cap carries a seven-year warranty for workmanship and materials, and a three-year warranty against rust-through. Available in six popular sizes. We truly do strongly suggest using a stainless steel cap instead of one of these galvanized caps. The stainless steel caps will last your lifetime, whereas the galvanized cap will rust through eventually and cause staining to your chimney. 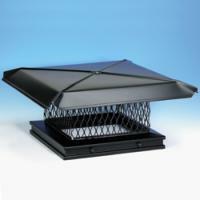 But if you insist on a Black Galvanized Chimney Cap, we do carry the best made here at Hart's Hearth. Fits Flue Sizes from 6.5" X 6.5" up to 8.5" X 8.5"
Fits outside tile dimensions from 6.5" x 11.5" up to 8.5" X 13.5"
Fits outside tile dimensions from 6.5" x 16.5" up to 8.5" X 18.5"
Fits outside tile dimensions from 11.5" x 11.5" up to 13.5" X 13.5"
Fits outside tile dimensions from 11.5" x 16.5" up to 13.5" X 18.5"
Fits outside tile dimensions from 16.5" x 16.5" up to 18.5" X 18.5"